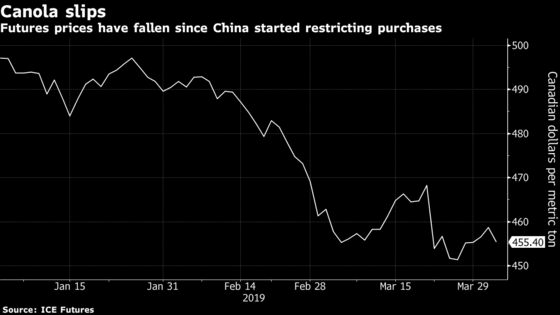 (Bloomberg) -- After getting China hooked on canola, Canadian growers of the oilseed are reeling from the Asian giant’s decision to cut imports. They’re standing pat, though, on their production plans. Canola is as Canadian as maple syrup, its name a contraction of "Canada" and "ola." University of Manitoba and government researchers created the crop in 1974, reducing certain acid levels in the inelegantly-named rapeseed plant to make the oil edible for humans and the meal edible for animals. "We don’t feel that at this point we will switch any of our crop intentions," said Clinton Monchuk, a farmer near Lanigan, Saskatchewan, by telephone. He’s got his seeds, and has "80 to 95 percent" of his crop planned out, he said. The situation is complex. In March, China rescinded export licenses for Richardson International and Glencore Plc unit Viterra’s. A third unidentified company has also received a non-compliance order. Some have forecast that Canadian canola acreage will drop this year. Richardson International Chief Executive Officer Curt Vossen, for instance, said he expects acreage to fall by 5 to 15 percent during government committee meetings on April 2. Since rumors circulated in January that China would slow purchases, the May canola contract has dropped about 7 percent to C$455.50 per metric ton as of 12:13 p.m. in New York. As the 2019-20 crop year nears, exporters are looking at other export markets, according to the Canola Council of Canada. "We have canola in around 50 or so markets around the world,” according to Jim Everson, president of the Canola Council, which takes an average of three trips to China annually. "Is there some swing capacity in certain markets today? Yes there is," said Kyle Jeworski, the chief executive officer at Viterra, which processes and markets crops, during an April 2 government meeting. Overall, though, “it requires a lot of foresight and planning to be able to actually talk about diversification," Jeworski said.